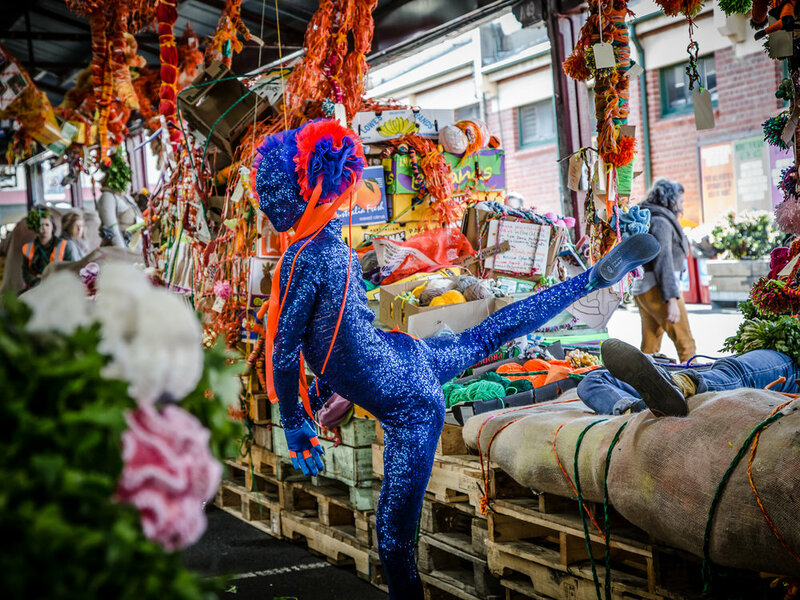 The final day of Biennial Lab’s activation at the Queen Victoria Market was by far the fullest day of the whole week. There are always $1 bags of fruit and veg, cheap, good quality meats and seafood and an exhausted but rambunctious feel about the place. The artists were able to add to this chaos, in quiet or bold ways. Kenny Pittock's drawing workshop. Photo by Bryony Jackson. 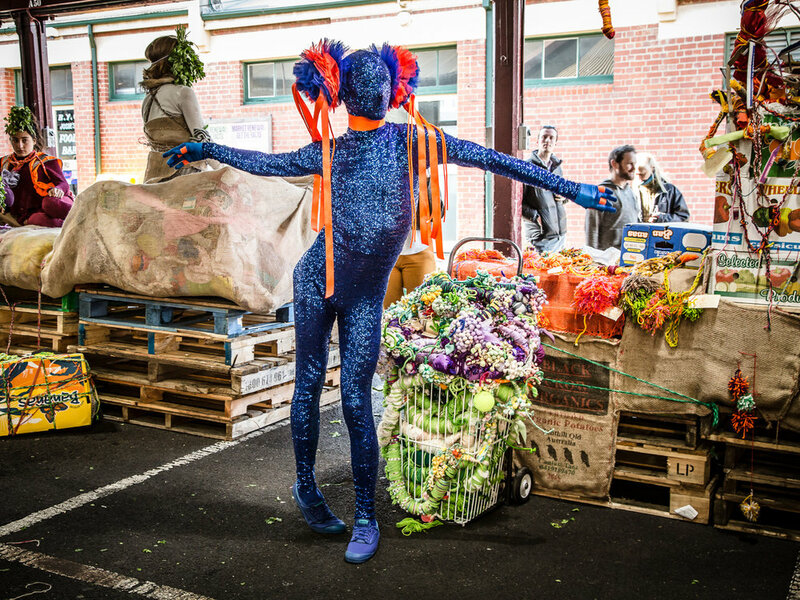 The day started off with Melbourne-based artist (and Biennial Lab’s unofficial comedian) Kenny Pittock giving a drawing workshop in which participants responded to the market landscape and the objects within that landscape. Participants learned how to think differently around the objects we see in that space, and add their own twist to the representations of these objects. You can view some of the drawings that Kenny drew during the Lab here. Kym Maxwell running a workshop as part of The Mechanics Institute's Trade School. Photo by Bryony Jackson. 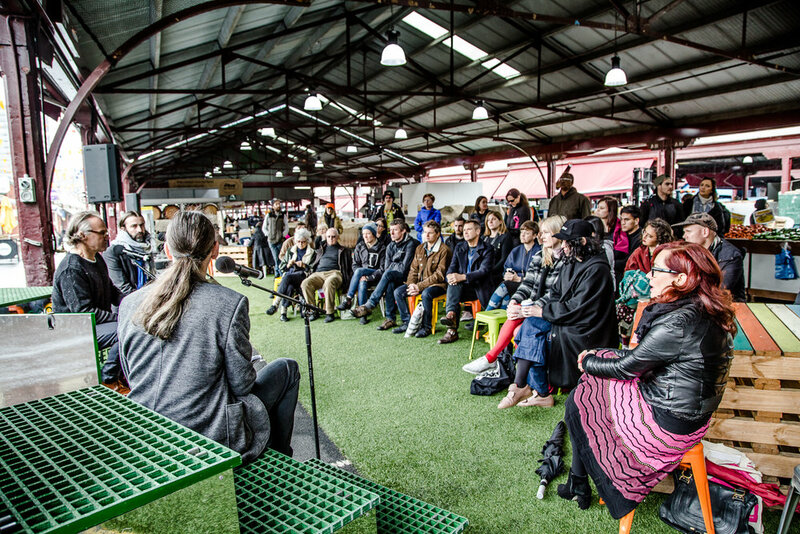 As part of The Mechanics Institute’s Trade School, Melbourne-based artist Kym Maxwell brought in a bunch of tyres (a nod to Allan Kaprow’s Yard) and spoke on the immateriality of socially-engaged practice and what that might mean for the artwork’s afterlife. 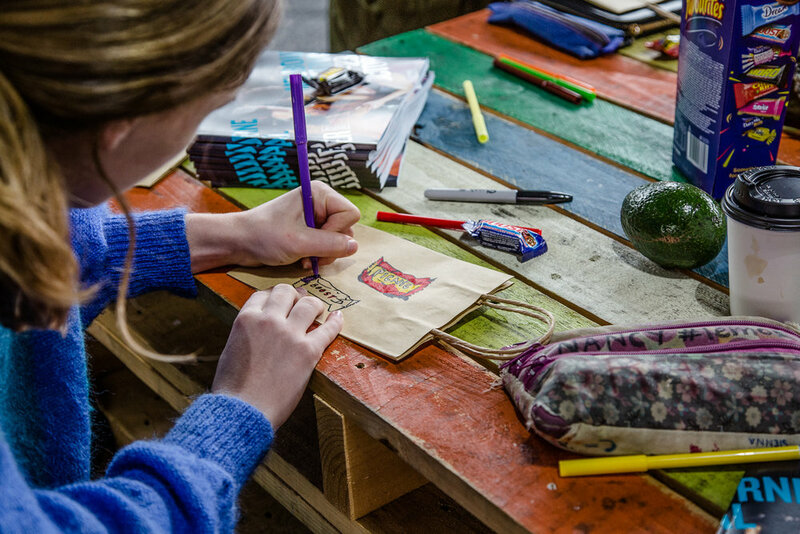 Participants were invited to use drawing materials to map out a response to both the documentation of ‘immaterial’ or ephemeral art projects of yore, and the concept of social engagement in and out of time. People making miniature fruits as part of Isobel Knowles and Van Sowerwine's model-making workshop. Photo by Bryony Jackson. Isobel Knowles and Van Sowerwine held an official model-making workshop whereby audiences witnessed the making of objects within the film component of Out in the Open, and were able to make the objects within it themselves. Drawing by Kenny Pittock. Oslo Davis is a Melbourne-based illustrator, artist and cartoonist. 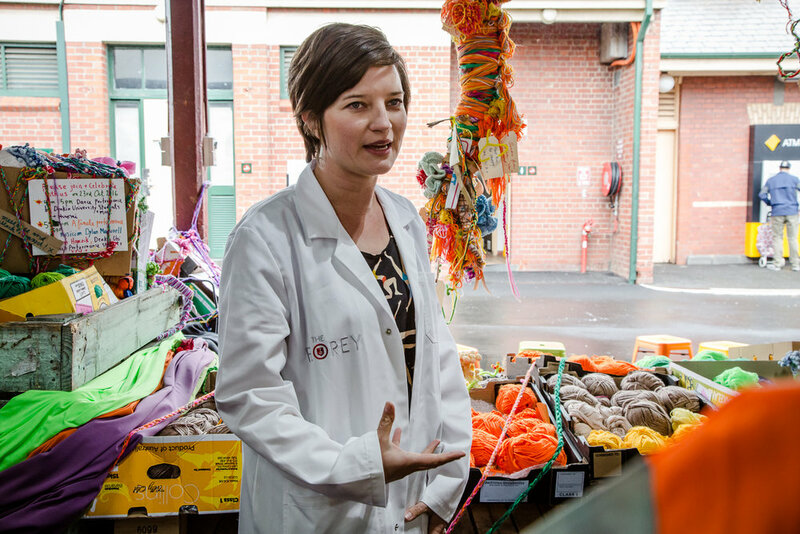 Dr Emma Burrows leads a walk through the Queen Victoria Market, as part of a talk with Hiromi Tango and Natalie King. Photo by Bryony Jackson. 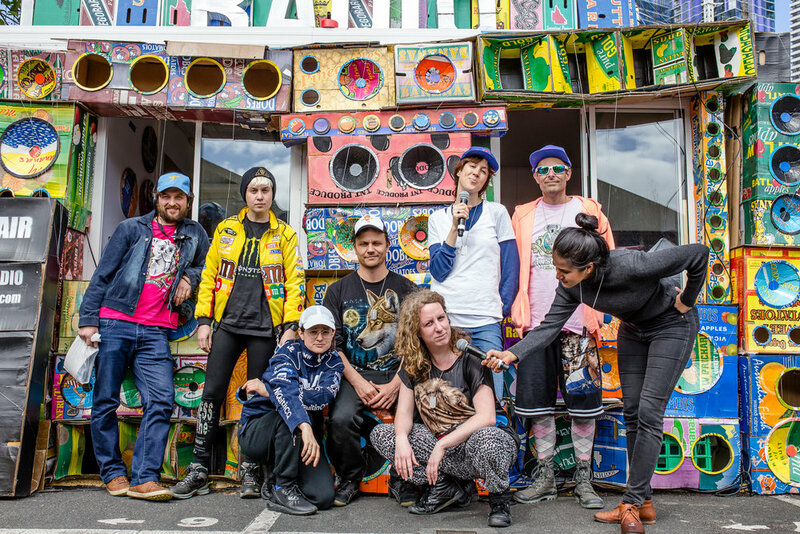 Running together with Hiromi Tango’s sculptural installation, Wrapped, the artist engaged in a conversation with her collaborator, The Florey Institute’s Emma Burrows, and Chief Curator Natalie King. Burrows told us about the ways in which neuroscience has a way of shaping our brains according to the lives we lead, through our emotional and physical upbringing. 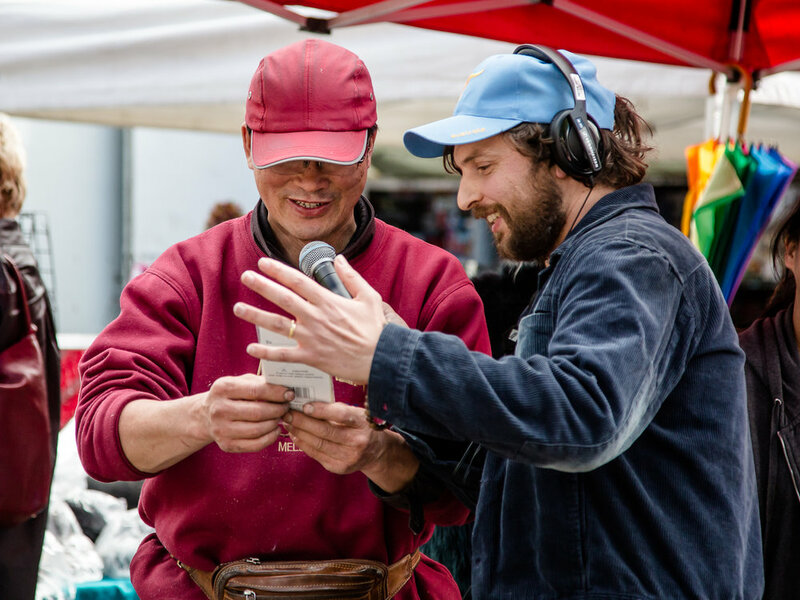 Together with the artist, Dr Burrows took us on a walk through the market so as to pinpoint different ways in which our senses engage with the different stimulus of the marketplace. Jefa Greenaway, Tony Birch and Timothy Moore (SIBLING) talking as part of Unmonumental. Photo by Bryony Jackson. 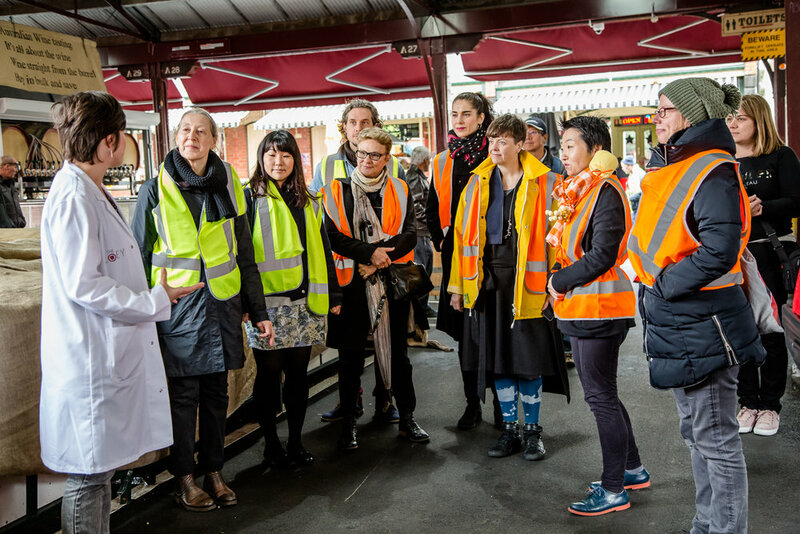 Biennial Lab was lucky enough to snag award winning author, Tony Birch to discuss the concept of the [un]monumental and memorialising in public space. 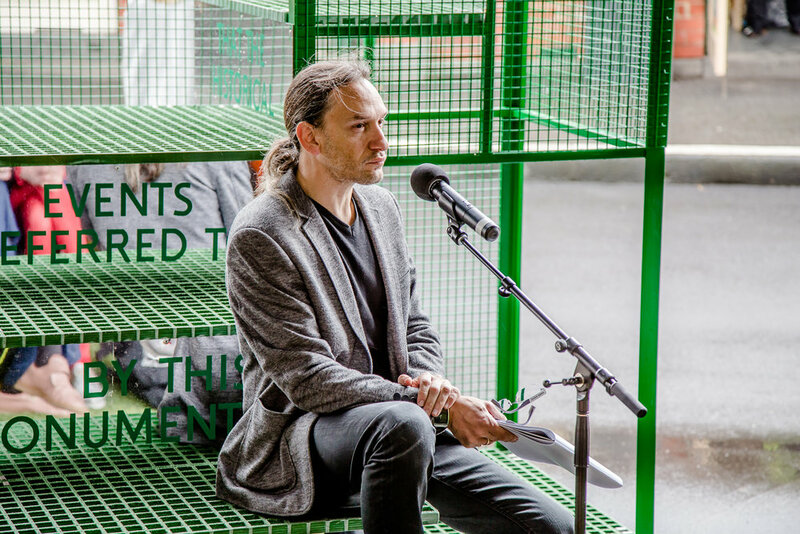 The author, in his career, lends poetry to the unseen and unheard histories of a colonised Australia, and in conversation with Jefa Greenaway and the artist, Timothy Moore (SIBLING), the three explored ways in which these histories can be hidden in our visual, and indeed, monumental planes. The talk specifically pivoted around SIBLING’s use of the Batman monument, which sits on the edge of the Queen Victoria Market, originally being a headstone for colonist and ‘founder’ of Melbourne, John Batman. It was great to hear about the ways in which public space can have such a profound, yet often subconscious affect on the mentality of this country. Kate Ten Buuren performing as part of Steven Rhall's Gesture (70º East) New Day Rising performance event. Photo by Bryony Jackson. After listening to Jefa, Tony and Timothy talk, we headed over to see Steven Rhall’s performance event. The performance featured a reading by Wiradjuri writer and activist, Hannah Donnelly, along the lines of some of the work she’s been doing on rethinking the ways in which Australians can both respect and interact with the land that we live on. This was echoed in a bodily performance by artist Steven Rhall, and friends Sarah Rudledge, Marcel Feillafe and Kate Ten Buuren. The performance saw the use of rope which created shifts in the way that we perceive the already skewed grid of Gesture (70º East) New Day Rising. The performers walked around the space flowing in and out of each other’s lines, eventually coming to a close with the rope layed in a heap on the ground. Khairuddin Hori speaking at his workshop as part of The Mechanics Institute's Trade School. Photo by Bryony Jackson. Back at The Mechanics Institute’s Trade School, visiting International Affiliate, Khairuddin Hori gave a workshop on the concept of the ‘lab incubator’, in which the curator workshopped the idea of bringing giving deeper engagement to art practice through different modes of thinking and making. Performers as part of Kiron Robinson's Choral Lament, to accompany his work, Upon this troubled sea. Photo by Bryony Jackson. Across to K Shed, where Kiron Robinson’s work was strung up in the rafters of the shed, almost a beacon in the dark, reading ‘Upon this troubled sea, I rest my head’. 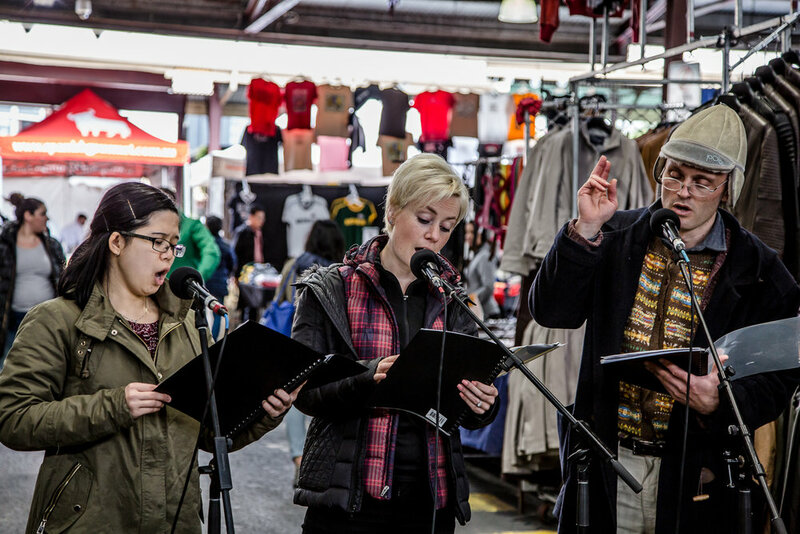 As part of the artist’s work, three choral singers were invited to interpret the work in collaboration with the artist, and as they sung, on varying scales, the phrase ‘Upon this troubled sea, I rest my head’, a calm descended upon the chaos that is the market. It was a moment for pause in the cacophony of the marketplace. Field Theory's sleeping quarters at the Queen Victoria Market. Photo by Bryony Jackson. The cacophony, however, resumed once we made our way over to Field Theory’s countdown. Having slept, eaten, spoken, and lived in the space of the market for 6.25 days, you could sense both the frazzled exhaustion and the excitement at being able to finish in the air. Sigrid Thornton speaking on Field Theory's 9000 Minutes. Photo by Bryony Jackson. 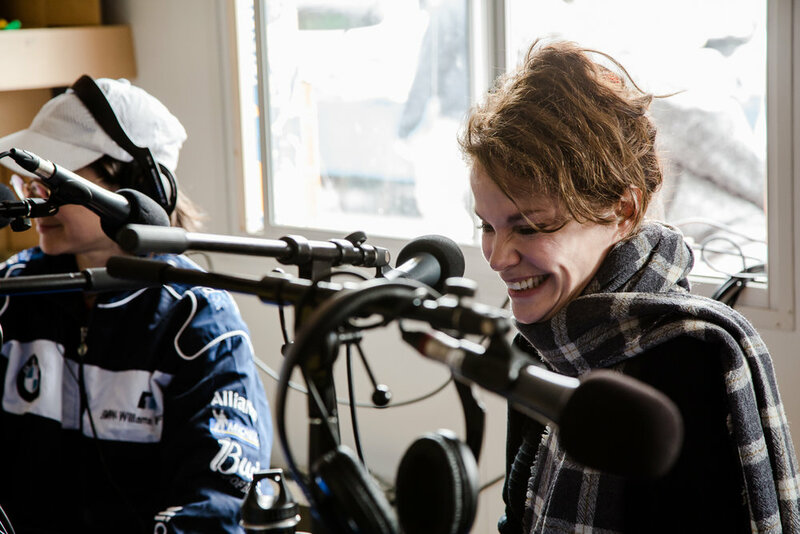 Today in Field Theory’s 9000 Minutes broadcast, the artists witnessed and spoke with a slew of market traders and visitors, including Sigrid Thornton and government folk. 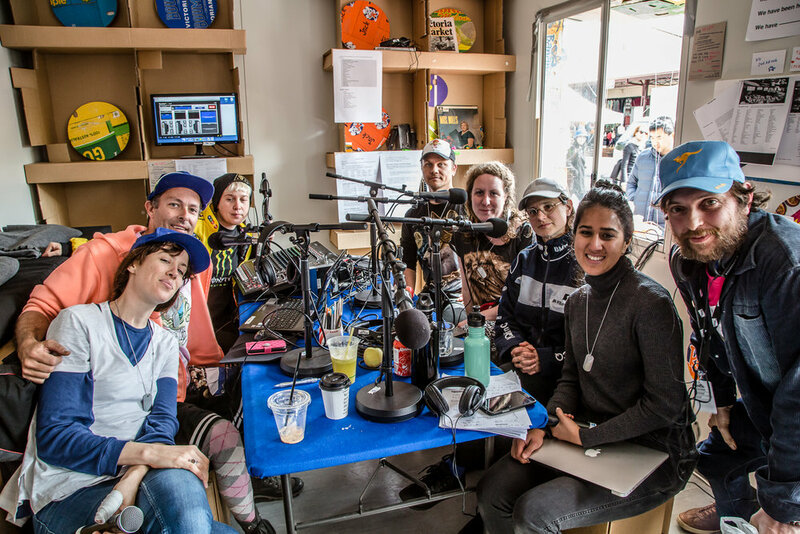 This multitude of voices was a great way of showing how important community radio is for getting voices and ideas out there, and allowing for those voices to have dialogue with each other. 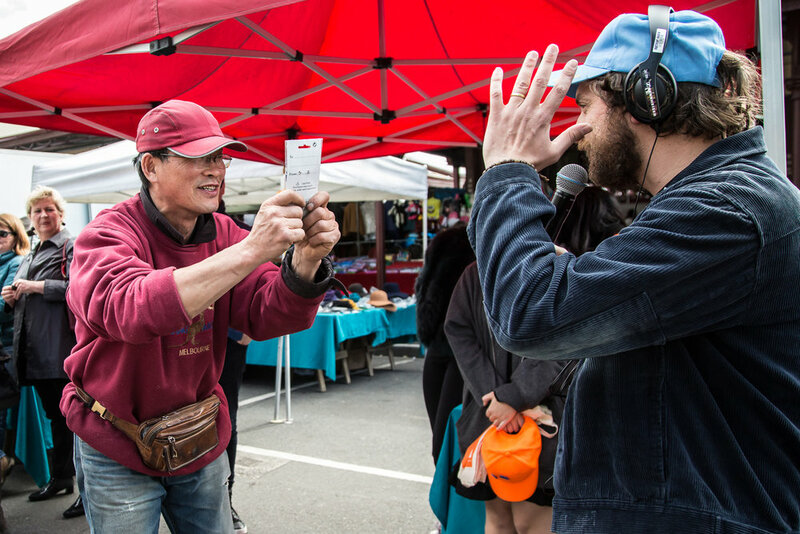 Trader being awarded a prize as part of Field Theory's 9000 Minutes. Photo by Bryony Jackson. Field Theory's final minutes. Photo by Bryony Jackson. Field Theory celebrate! Photo by Bryony Jackson. Having survived the 6.25 days, the artists awarded each other and traders with various prizes, including one for their favourite trader. The team were finally allowed to leave their post in the colourful construction of the Field Theory broadcasting station and go home to shower. Sophia Brous performing as part of Biennial Lab's closing ceremony. Photo by Bryony Jackson. 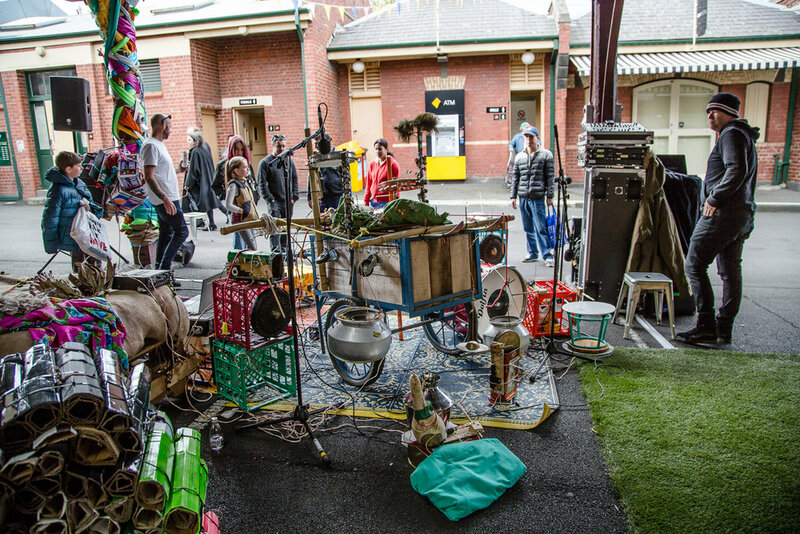 As Field Theory would up their broadcast, we went over to the A Shed, in front of Hiromi Tango’s work, where Melbournian songstress, Sophia Brous gave the market space her first lullaby. Sensitive as it was bold, the singer’s voice echoed through the shed and mingled with the quieter-than-usual sound of traders packing down. Dylan Martorell's self-playing instrument used during the closing celebrations of Biennial Lab. Clanging with energy to interrupt this quiet moment was Dylan Martorell’s self-playing instrument, to which Hiromi Tango, Benjamin Hancock and Biennial Lab volunteers performed. Striking and sparkly, Hancock’s performance with Hiromi, who was decked out in matter accumulated from the market, echoed a sensitivity and emotional capacity to think the space via bodily movement. Benjamin Hancock performs in Hiromi Tango's 'Wrapped'. Photo by Bryony Jackson. Hiromi Tango performing in 'Wrapped'. Photo by Bryony Jackson. Benjamin Hancock and volunteers perform in Hiromi Tango's 'Wrapped'. Photo by Bryony Jackson. We heard Sophia ring out one last lullaby, sensitive and kind, to wrap up the inaugural Biennial Lab, memorialised through the poetry of song.